After the successful premiere back in November, the Silver Screen lands again at Oxton Village Hall on Saturday 11th February with the second showing by the village’s film club, The Projection House. Those who like their films in cinema-style surroundings won’t be disappointed. With a large screen and fantastic sound equipment you’ll have the sights and sounds of your local cinema, all on your doorstep. There’ll even be popcorn, ice cream, alcoholic and non alcoholic drinks on offer. Lights, camera, action! 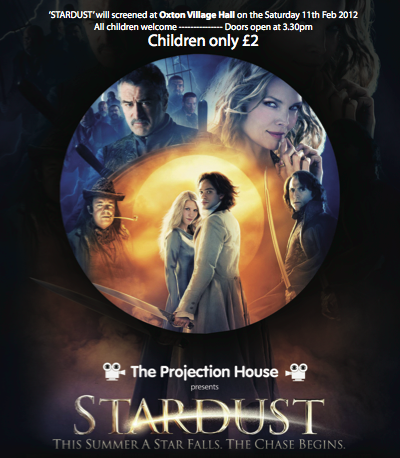 First up is STARDUST (PG), a treat for children and adults alike, based on the book by Neil Gaiman and featuring a host of stars including Michelle Pfeiffer, Ricky Gervais and Robert de Niro. The film is set in a magical land bordering a tiny English village (think Southwell, if it was inhabited by pirates, witches and warring princes – which of course it is!). One day, Tristan Thorn bets Victoria, the girl of his dreams, that he can bring her a falling star. When the star turns out to be a princess, Tristan is forced to defeat those competing to possess her in order to win the heart of his true love. The film starts at 4pm, with doors opening at 3.30pm. The second film, THE BOURNE ULTIMATUM (12A), is the third film in the trilogy starring Matt Damon as Jason Bourne. It continues his quest to find the rogue CIA agents who trained him as an unthinking assassin by stealing his memory and true identity. It’s a fast moving and thought provoking thriller with stunning action sequences. The film is showing at 7.30pm, with doors opening at 6.30pm. Tickets cost £4 for adults, £3 for concessions and £2 for children, and are available in advance from Oxton Village Shop, Ethel Cottee on 0115 9653477 and Roy Walker on 0115 9653595. Tickets will be on sale on the day costing £5 for adults, £4 for concessions and £3 for children.